We at Barking Mad About Films are looking forward to seeing Kong: Skull Island upon its release. 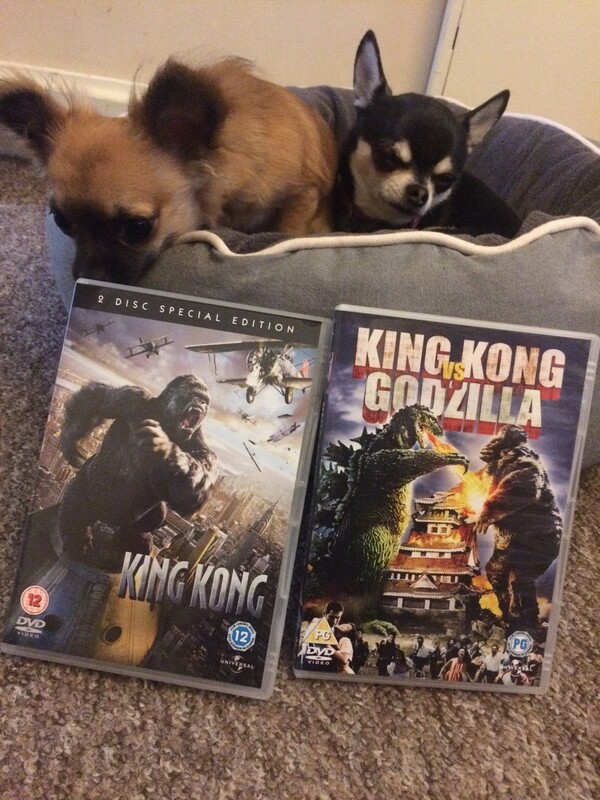 Like many other reboots/remakes/sequels, it always makes up want to revisit the originals, now we have two Kong titles in our DVD collection; the most recent Peter Jackson remake and a Toho classic of 1963 when King Kong was used as an adversary for Godzilla. Both are good watches, yet both have their faults! We would probably rate both 3 out of 5 from our rating scale! King Kong vs Godzilla has a simple enough premise. Once again Kong has been captured, this time by a pharmaceutical company in Japan, as they believe his growth, as well as tomato-sized berries that have been found on the island he inhabits, could be a miracle cure. Meanwhile, Godzilla has broken free from a glazier, so the Japanese authorities order that Kong gets returned to his Island, of course, he doesn’t and after both creatures cause destruction by themselves they have an almighty batter at the end of the film, using everything from trains to trees as weapons. We watched a dubbed version of the film made for American audiences and it is good if dated viewing. The miniatures stand out, yet it’s the creatures that cause the issue, not because we are big lovers of CGI, it just made us feel nostalgic for the old Chewits adverts! Fast forward to 2005, Peter Jackson, hot from making the Lord of the Rings trilogy remade the classic 1933 King Kong starring Fay Wray as Ann Darrow, itself having already been rebooted with another story of adventures coming across Kong in 1976 starring Jeff Bridges; Jessica Lange and Charles Grodin! Many of the effects as you would expect from a Jackson film are outstanding, especially scenes involving a motion captured Kong (played by Andy Serkis) yet some look very ropey, clearly added in with green screen, it is well worth a watch, we found the 2 disc version cheap in a charity shop and it is worth it alone for the extras. The film is fantastic to look at, and it captures New York in the 1930’s as well as Fantastic Beasts did recently. However it is a real slog to watch in one sitting, you could watch it in 3 instalments as near or near enough to an hour in each. Part 1 – getting to Skull Island; Part 2 – Kong’s Island and then of course Part 3 – Kong in New York, where it ends in the iconic scene at the top of the Empire Stare Building. Neither film was a poor watch and we are now very much looking forward to finding some foam bananas in the pick n mix and settling down to watch Kong: Skull Island upon its release!